Activision has announced Call of Duty: Black Ops 4 will introduce cosmetic variations of the base firearms called signature weapons. Two of the signature weapons can be unlocked before Black Ops 4 even releases, but you’ll need to complete in-game challenges to get the rest. Signature weapons do not provide any in-game benefits over the base weapons. Instead, they act as bragging rights. Most signatures are locked behind specific challenges that will test your skill in different ways. Completing different challenges nets you additional rewards, with the Mastercraft variant being the final and most difficult design for all signature weapons. If you run into another player with a Mastercraft version of a signature weapon, you’ll have a better idea of just how skilled they are and how much time they’ve invested into Black Ops 4. Two of the signature weapons can be unlocked without completing any in-game challenges. If you pre-order Black Ops 4’s Digital Deluxe, Digital Deluxe Enhanced, Pro, or Mystery Box Editions you’ll get a MX-9 signature weapon on day one that wraps the SMG in a golden eagle design. The Divinity Strife Pistol Signature Weapon can be unlocked day one by pre-ordering Call of Duty: Black Ops 4 from GameStop. One of Black Ops 4’s other signature variants of the Strife pistol, the Divine Justice, can only be unlocked by completing in-game challenges with the Divinity. So if you want a heads start on the Divine Justice, you better pre-order Black Ops 4 from GameStop to get the Divinity. Call of Duty: Black Ops 4 launches on October 12 for Xbox One, PS4, and PC. The beta for the game’s battle royale mode, titled Blackout, starts on September 10 for PS4 and September 14 for Xbox One and PC. The Predator is unquestionably one of the most iconic movie monsters in modern cinema. First introduced in the 1987 classic Predator, this ruthless, highly intelligent killing machine was seen working his way through a heavily armed squad of soldiers before meeting his match against the equally iconic Arnold Schwarzenegger. The success of the movie has led to five sequels–including the upcoming The Predator–plus a wider universe of comic books, novels, and video games. But despite the brilliance of that initial Predator design, the first movie started shooting with an entirely different alien protagonist. The original Predator costume had a long neck, a strange bird-like head, and backward-bending legs, but technical issues with the suit led to production closing down for several months while makeup effects visionary Stan Winston worked on a new look, which is now part of movie history. Since then, the look of the Predator has evolved from movie to movie, with each new entry in the series adapting and updating the basic design. Some of these changes are to the armor and weaponry, and sometimes to the appearance of the alien itself. Often the changes are to make the Predator look scarier than the previous film, but occasionally a more sympathetic Predator is required, such as in the first Alien vs. Predator. The writers, artists, and designers of the comics and games have also taken the design in some interesting new directions. In 1994, a name was given to this race of alien hunters–the Yautja. The name is never used in the films, but was introduced into the wider universe in the novel Alien vs. Predator: Prey and is now commonly used by fans. The same applies to the names of the Predators themselves–many of these were simply used on set or have been applied by fans after the movies were released, but are now accepted titles. With the latest movie, The Predator, hitting theaters on September 14, we’ll soon be able to see what the next stage of Predator evolution is. We already know from the trailers that director Shane Black has something very big and scary in store. So here’s a look back over the past 31 years of Predator evolution, to see exactly how this much-loved (and feared) movie monster has changed. Let’s hunt! Fortnite‘s wild popularity continues, and Epic Games is looking to capitalize on that with a significant presence at PAX West 2018. This consists of a number of things, including the conclusion of the ongoing Summer Skirmish tournament, where $1.5 million is up for grabs to those at PAX West. What you’ll also find if you’re at the show is Lazy Links Live. One of the major additions to Fortnite: Battle Royale’s Season 5 map has been a golf course and golf carts (in the form of the All-Terrain Kart, or ATK). With that in mind, Epic has set up a nine-hole mini-golf course inspired by the in-game Lazy Links golf course. This is located inside the convention center where PAX is taking place. To make it even more worth a visit for those at PAX, Epic has brought in professional cosplayers who have dressed up as some of the game’s best skins. You can get a look at this cosplay and the golf course above. As always, there’s a lot happening in the world of Fortnite. Epic has released a new Battle Royale dev update video that outlines changes to storm damage, as well as plans to vault the revolver. There’s also a new event, High Stakes, on the way next week that will consist of multiple things: a limited-time mode called Getaway, a Wild Card skin, and High Stakes challenges. Details are still scant, but in the meantime, there’s plenty to do thanks to the release of Week 8 challenges. Among other things, those call on players to search between oversized seats and to use Rifts at different spawn locations. The most recent content update also added the new shockwave grenade. Are you running out of things to watch on Amazon Prime? Well, September is almost here, and that means there is a whole slew of new TV shows, movies, and Prime Originals for you to binge in your free time. Here is what you have to look forward to in September. There are five new Prime Original series debuting. The most notable is King Leer, which stars Anthony Hopkins playing the iconic titular role based on the work of William Shakespeare. Additionally, there is Six Dreams, a documentary series which follows a Spanish soccer league and three of its players: Atletico de Madrid’s Saúl Ñíguez, Athletic Club Bilbao’s Iñaki Williams, and Real Betis’ Andrés Guardado. On the comedy side of things, Fred Armisen and Maya Rudolph star in Forever, a series about a couple who have hit a slump after years of repetition. For new movies coming to the service that you may have missed in theaters, September 29 marks the arrival of the horror movie Jigsaw, which is part of the gruesome Saw franchise. There is also Escape Plan 2–which wasn’t in theaters–and while the movie’s focus isn’t on Sylvester Stallone as much as we’d thought it would be, it’s still a solid action movie. If you’re looking something from the past, Amazon has a ton of movies you’ll want to rewatch including Ghostbusters and Ghostbusters II, arriving on September 1. If you’re getting ready a bit early for Halloween, there a few horror movies as well, including Pumpkinhead, Poltergeist II, the original The Amityville Horror, and the 1989 Adam Sandler movie Going Overboard, which may be the scariest of them all. Check out the complete list of everything coming to Amazon Prime in September below. 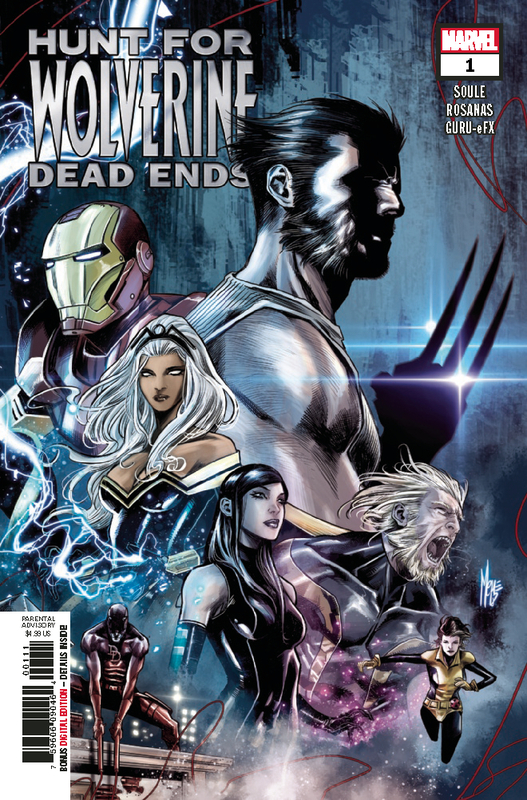 Marvel just wrapped up four separate Hunt for Wolverine miniseries, with each book featuring a different team trying to track down the wayward Wolverine and learn what he’s been up to since his unexpected return. None of these teams were entirely successful, and this finale issue sees Daredevil and Iron Man travel to the X-Mansion to compare notes with Kitty Pryde. This is a SPOILER-FREE review of the first season of Tom Clancy’s Jack Ryan. All 8 episodes are currently available to stream on Amazon Prime Video. In Tom Clancy’s Jack Ryan Season 1, the sixth live-action adaptation of the titular hero, creators Carlton Cuse (Lost) and Graham Roland (Fringe), successfully breathe new life into a screen franchise that hasn’t been relevant since the early ’90s, when the character was portrayed by actors like Harrison Ford (Patriot Games) and Alec Baldwin (The Hunt for Red October). This time around, we’re given a much younger version of Jack Ryan, played by John Kransinki (A Quiet Place), who goes from a lowly analyst sitting behind a desk to an action-oriented field operative, trying to take down the world’s most dangerous terrorists. The sequel to the first Fantastic Beasts film will be set among more of the iconic places from the Harry Potter world than were in the first film – including Hogwarts School of Witchcraft and Wizardry. To celebrate heading Back to Hogwarts, Warner Bros. has released a behind-the-scenes teaser video with commentary from the stars of Fantastic Beasts: The Crimes of Grindelwald. “Those names, the stories, the histories, that sit in the back of our mind from the Potter series begin to weave their way into Beasts,” Eddie Redmayne said. Adventure Time is embarking on its final quest on September 3, with the fate of Candy Kingdom hanging in the balance. To commemorate Jake and Finn’s fantastical journey, IGN has an exclusive clip from the upcoming Adventure Time: The Final Seasons DVD, which goes on sale September 4 and includes every episode from Seasons 8, 9 and 10 in addition to a behind-the-scenes featurette, animatics and song demos from the last run of episodes. Looking back at the legacy of Adventure Time, it’s impressive to realize how many of the artists, writers and producers who worked on the series went on to create their own shows because of the lessons they learned in the Land of Ooo. In the exclusive video below, Summer Camp Island creator Julia Pott, Steven Universe creator Rebecca Sugar, and OK KO! Let’s Be Heroes creator Ian Jones-Quarty and co-EP Toby Jones reminisce about the impact the series had on them along with executive producer Adam Muto and voice artist Ashly Burch. After building a theme park at Gamescom 2018, Epic Games’ Fortnite has opted for a bit of sport for its PAX West 2018 showing – namely, a tough, detailed mini-golf course. IGN’s intrepid golfers hit the Lazy links at PAX for nine holes of Fortnite-inspired mini-golf. Check out dozens of photos of the golf course below to see the tricky shots we had to make to keep somewhat around par. For more on Fortnite, stay tuned to our in-depth video tour of the golf course, and make sure you check out the details on the latest announced Fortnite event, High Stakes.